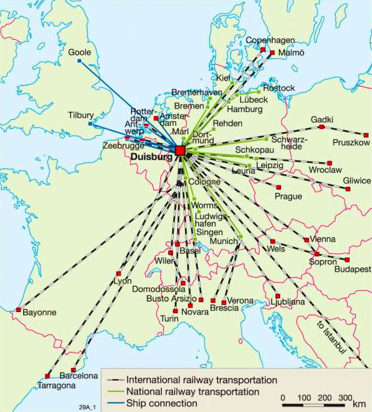 Duisburg is the largest inland port in the world you have never heard of. However, on Chinese maps, the medium-sized German city of 500,000 has rapidly grown in significance since 2013. After all, it is Duisburg, not Berlin, that is arguably the most important European node of the rail networks that make up Belt and Road Initiative (BRI). But what exactly makes Duisburg so special in the eyes of Chinese policymakers and led them to choose the city as a key hub of their trillion-dollar initiative? The one-word answer: logistics. Historically, it is the River Rhine that provided for the Duisburg’s economy and transport; enabling the city to be part of the ‘Amber Road’, a trading route which connected the Mediterranean, North Sea and Baltic Sea during the era of the Roman Empire. To this day, Duisburg remains the largest inland port in the world, handling 133 million tons of cargo every year, making it a global trading hub. Much of the local economy is built with the city’s unique location at the heart of Europe in mind. It is situated in Germany’s most populous state, North Rhine-Westphalia, and is in close proximity to commercial hubs including Cologne and Düsseldorf, at the same time being within 200km of ports in Amsterdam and Rotterdam. Over time, this advantageous location has enabled the city to create over 400 transport routes across road, rail and air to 80 different major cities. With the Benelux countries as neighbours to the West and access to Eastern Europe in the East; a consumer market of over 200 million people can be reached within a few hours. It is this unrivalled access to a vast pool of European consumers that gives Duisburg the potential to become a crucial transport and logistics hub for the BRI in Europe. It’s no surprise that 25 trains per week arrive in Duisburg from Chinese cities including Yiwu and Chongqing. The BRI seeks to open up new markets for Chinese companies, but simultaneously allows European companies better access to Chinese markets. As trade grows, so will the demand for the related transport and logistics services. Duisburg is a key beneficiary of this growth. If Duisburg’s logistics sector becomes the go-to hub for access Europe and Asian markets, then it will stimulate the creation of forward linkages in the local economy. For example, a company selling food products to China might choose to set up a regional distribution hub in Duisburg. These investments and forward linkages will provide better paid employment and bolster the city’s local economy. There are positive signs in this regard already. For example, Chinese e-commerce business Dolphin Cross-Border Tech is using Duisberg as its key European hub to import high-quality German products such as baby food and cosmetics back to China. Yet, transforming Duisburg as a gateway into both European and Asian markets comes with several challenges. While there are few credible competitors in Eastern Europe at this stage, countries such as Ukraine and Poland are accelerating their efforts in this regard. Only recently, Alibaba announced that it plans to build a logistics centre in Western Poland. Moreover, for Duisburg to be a true success it needs to act as a two-way street. It needs to facilitate improved access for European exporters into China as much as it does for Chinese exporters into Europe. Only then will it be widely accepted as a success; currently many trains returning to China do so with empty carriages. Duisburg has been growing faster than any other port in Germany over the last 17 years. However, In order for Duisburg to fully reap the benefits of its location and leverage its existing foundation as a logistics hub, State Minister of North Rhine-Westphalia, Groshek, has said that transport networks need to be upgraded and become more efficient. More rail, air and shipping routes need to be developed that embrace Industry 4.0 and allow industry and logistics to operate together seamlessly. Lastly, and perhaps most importantly, for Duisburg to make a success of the opportunities that come with the BRI requires a shift in mentality. The city itself must realise that it is not just any back-alley, but actually can develop global influence in the logistics and transportation sectors. In order to entice more customers to use Duisburg, it needs to improve its international profile. While a plan presented last year by the local Chamber of Commerce and employer’s association aimed to tackle infrastructure issues and provide more tax incentives for businesses, there is still much to be done with regard to image and ambition. Too often, politicization means that Chinese projects are viewed with suspicion and are therefore contained. But, in the end, the new hopes for Duisburg are much bigger than China; the city and the German government more widely needs to realise that BRI trade routes have the potential to open many other markets in Asia beyond China. And therein could lie the next wave of growth for Germany’s export machine.